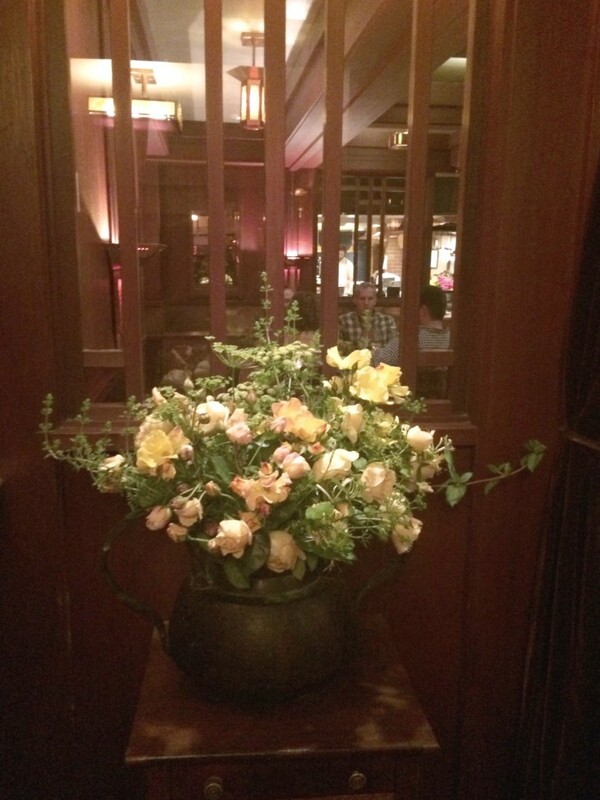 So, yesterday I fulfilled a desire I've had ever since I moved to the Bay Area, I got to go to Chez Panisse. If you don't know, Chez Panisse is a restaurant and cafe in Berkeley, CA by acclaimed Chef Alice Waters, who is the pioneer of what is known today as "California cuisine." California cuisine is usually low in fat and high in flavor with an emphasis on letting the local, seasonal and sustainable fruits and vegetables shine through, as well as utilizing high quality meats and seafood from California's own coast . First off, we arrived 10 minutes early and sat at the bar until they came to get us 10 minutes after our reservation time, so we were waiting a total of 20 minutes. Although the place is super cozy and warm, when you first enter it's kind of hard to tell where the hostess is, you kind of have to come in and stand around awkwardly until someone comes to greet you. So, by the time they came to get us I was a little bit irked, probably because I was super haaaaangry and needed food in my mouth like a crying newborn needs milk. When we were seated, we had the daily menu to look through incase we had some allergies or restrictions to any of the items on the menu. We were all in, no restrictions and we got the additional cheese supplement. First off, they brought out the amuse bouche. 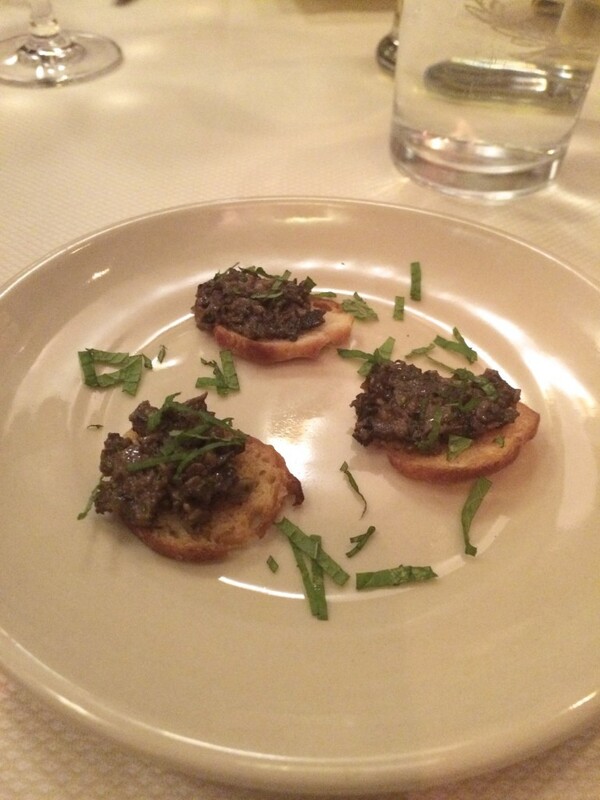 A morel mushroom mixture on tiny thin crostini, they tasted like little bites of garlicky, mushroomy umami. 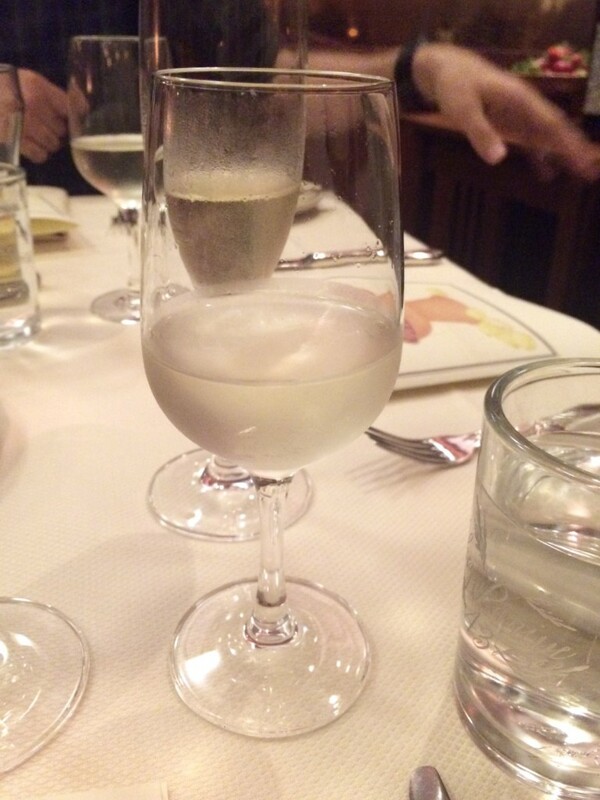 The aperitivo was a white wine with a simple syrup made out of a pine of some sort that wasn't too sweet at all. It was a great way to start the meal. This, ladies and gentlemen, was the third basket of bread we had received. I loved the French loaf, it was good. So good we had to beg the server to stop bringing us bread. After the third basket of course. The first course was perfectly balanced. It was a king salmon and halibut carpaccio, with shaved rhubarb, and anise hyssop. Anise hyssop was recommended by Bon Appétit in it's Garden like a Chef article and now I'm even more convinced I need to grow it after tasting this dish. The next course was my absolute favorite. I'm not a huge soufflé fan but this savory soufflé made me a stage 5 clinger/superfan of the soufflé. 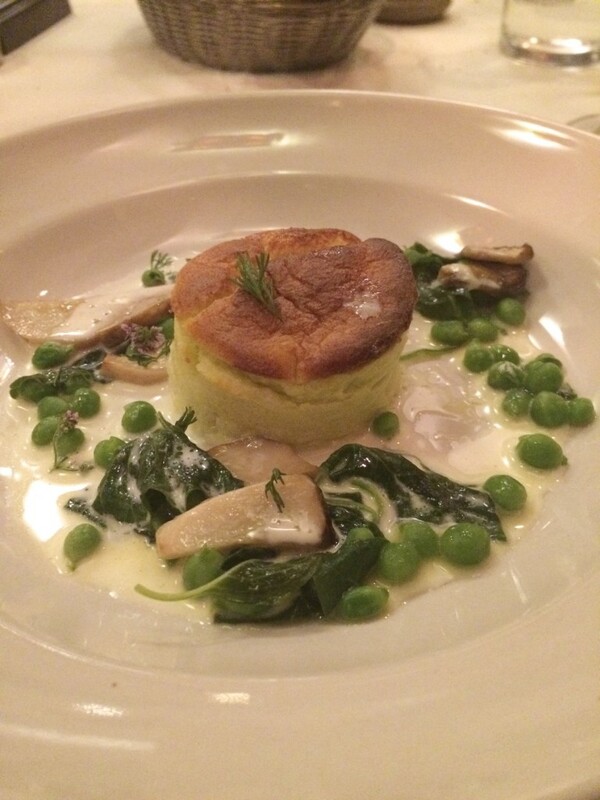 First of all, it's an un-molded soufflé which is impressive in and of itself, but the real majesty here lies in the delectable combination of ingredients: porcini mushrooms, cheese, garlic, sweet peas and coriander. What I was really impressed by with the third course was how they were able to achieve that charred smokey grilled flavor. I can't tell you how many times I've had something "grilled" in a restaurant that was lacking in this area. Carbo loading does not even begin to describe what happened that night. We had the cheese supplement which was so balanced as well. Goat cheese, walnut bread and dried mission figs. You know what's not best though? Chipped plates with shards of plate on your plate. If I wasn't paying attention I could have eaten those little shards of plate. At my old job, they made us throw away chipped plates. "Not worth the risk," they said. 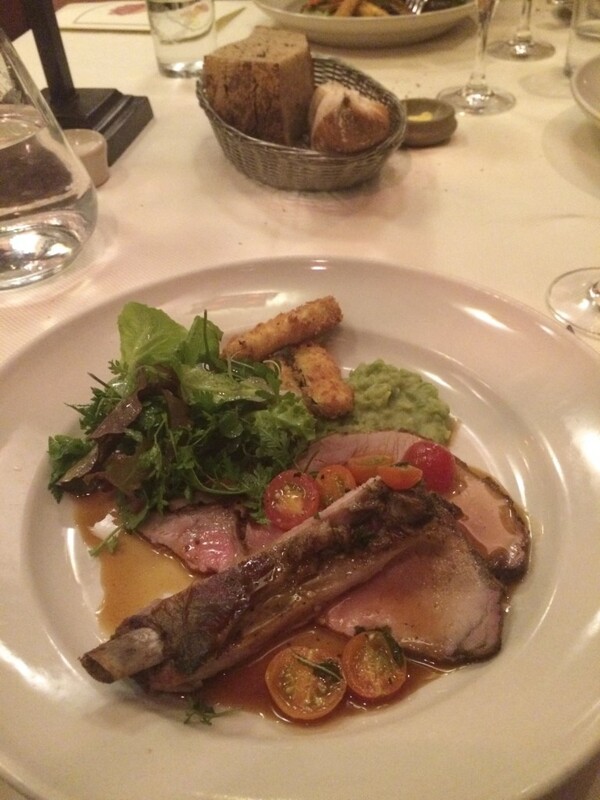 I was so busy thinking about it that when the next course came, I totally forgot to snap a pic. It was an apricot galette (which is kind of like a pie) with almond ice cream. The ice cream was addictive. I scraped every last bit off the plate. The apricot galette had a wonderfully crispy glazed crust that let out a satisfying crack under the weight of a fork. The apricot filling itself was flavorful and sweet but had a bitter aftertaste that mademe want to dive back into the ice cream to mask the flavor. Overall, I would say the food was a 9/10. The decor was pretty classical, it felt timeless. They have lots of old-timey French posters everywhere too. For my taste (which is more fun and colorful), I found the ambiance and decor to be a 7/10 with the open kitchen design being the best feature. 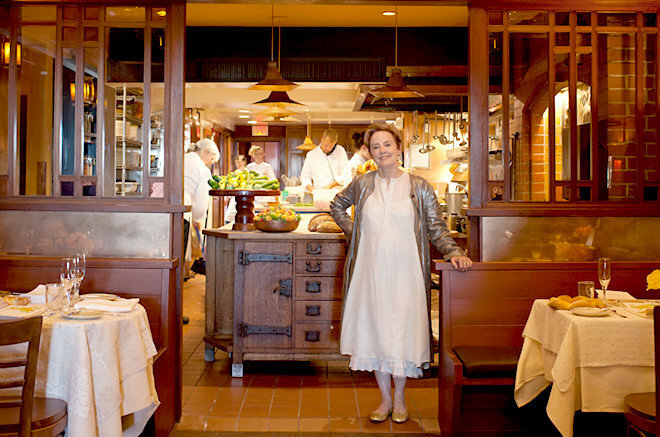 Here's a photo of Alice Waters (taken by someone else), but it shows that design I was talking about. I would recommend this place because the food doesn't disappoint, although the attention to detail may not have been up to par I did genuinely enjoy myself and so did the people I went with. Final Say: Go. It's a must see if you're into the whole organic, local, seasonal and sustainable thing. Just be aware of small oversights that may occur.